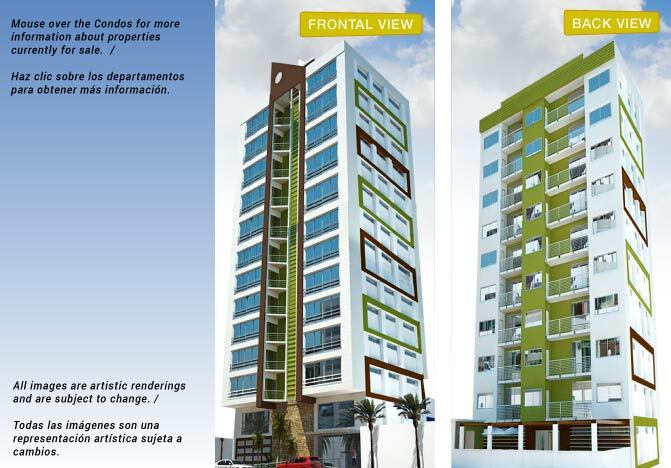 Why rent when you could own your own new condo on Ecuador´s favorite Expat beach? Located impeccably 2 blocks from the beach and in easy walking distance from Salinas´s most popular restaurants, cafes, and bars, sits Torre Marbella, Salinas´s newest luxury condominium building. Act now, Only 12 units left! The tower is located on 4600 m² of prime real estate, and the Torremolina crew is well underway constructing the 1, 2 and 3 Bedroom condos with top quality finishings, which will comprise this iconic new building. Prices are starting at only $64,500 USD, representing one of the areas most exiting investment opportunities. Torre Marbella already reaches high into the skyline and will eventually stretch to 11 floors. Condo sizes range from 70m² to 197m². American design concepts including large open areas and use of natural light are implemented in all units and condo owners will have access to the community swimming pool and jacuzzi, bar, rooftop terrace, BBQ area, gym, and more. 24 hour security is maintained so that all homeowners will feel at ease. In the last year, San Lorenzo has become one of the fastest growing neighborhoods in Salinas. With the majority of the Salinas Malecon occupied with condos built in the 90s that are beginning to show their age, San Lorenzo--alongside the more expensive Chipipe--has stepped in to meet the insatiable demand for new luxury condos. Say goodbye to snow, traffic and stress and start enjoying the refreshing ocean breezes. Salinas offers shopping malls, banks, supermarkets, and a thriving cosmopolitan culture of expats you will not find anywhere else on the Ecuadorean coast. Your new friends are waiting to meet you! Financing is available – Reserve your condo today with $2000 down, and take advantage of early bird pricing with a proven developer with an ample track record of successful projects. Salinas is a coastal Ecuadorean city adorned with condominiums stretching along the beach, open markets, luxury restaurants where tourists can enjoy a beach lifestyle with plenty to do at reasonable prices. Salinas is priveledged among Ecuadorean beach towns. It is a dry, temporate climate, is home to a domestic airport and immediate care medical facilities, and is just 90 minutes from Guayaquil, its international airport, and world class hospitals. For these reasons, the personal finance journal Kiplinger has selected Salinas as one of the Top 8 retirement locations around the world. While the usual array of beach activities will be at your disposal (surfing, jetski rentals, sailboat charters, etc) , it is the community of expat events that makes Salinas stand out. There are trivia nights, póker games, sunset cruises, 4th of July parties, and never does a weekend pass without something new and fun to do. From June until October the humpback whales pass just off shore on their anual migration north and can often be seen from the beach. Nearby in Baños de San Vicente, you can find natural pools in volcanic rocks where tourists can receive massages while enjoying the spectacular scenery. Come visit and see why retirees from all over the world continue to flock here: spectacular fresh seafood, perfect weather, and awesome people. Constuctora Torremolina is a business group of public and private sector construction specialists and contractors whose misión is to satisfy the needs of their clients before, during and after their projects are completed. They pride themselves on quality standards, meeting deadlines, and maintaining positive relationships built upon experience and professionalism. Sofia knows Torre Marbella better than anyone, having worked closely beside developers to manage the project´s commercialization from the beginning. With passion and dedication within the real estate industry, Sofia brings a client focus to the team, always seeking to better understand the customer´s needs and unique individual requirements. Ciudadela Santa Paula, Salinas, Santa Elena - Ecuador.